Hi….I wanted to make sure to tell you upfront that the product mentioned in this post have been received for free for evaluation purposes. With that being said rest assure that I only give honest opinions. The opinions are my own and always will be. Thanks for visiting. 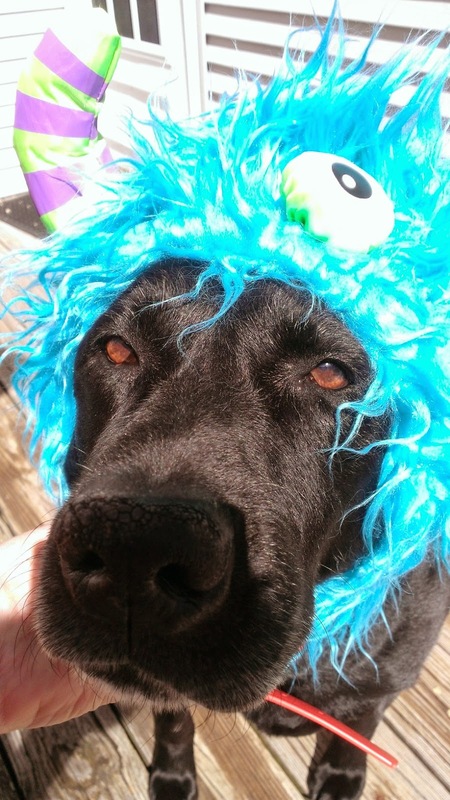 If you follow Barking Wednesday you might have seen the post where King is trying on his new Monster Costume for Halloween 2014. Wholesale Halloween Costumes sent the Monster Hoodie to King for King to do a review on the product. You know it looks really cute on him! 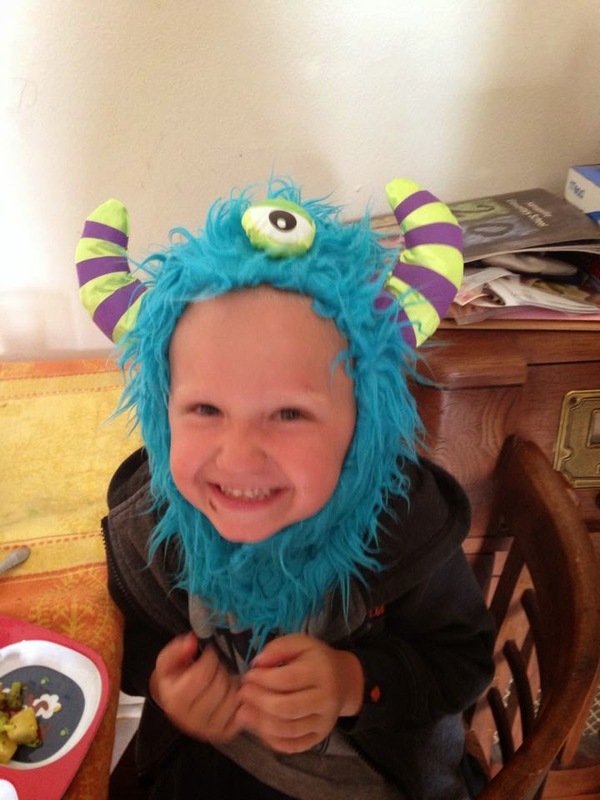 Put some blue and green old clothes on Davey...and we have a super happy Sulley Monster. The Monster Hoodie is perfect for kids to wear especially on the cold Halloween nights that we have in Wisconsin. Now I have two reviews...King will wear it...I love it on KING! Davey LOVES IT! I am positive when Halloween is over the Monster Hoodie will be a very popular item for Davey to wear. MONSTER HOODIE check it out! Davey told me he is going to wear it as a winter hat. Check them out....King and Davey both wearing the Monster Hoodie! Priceless fun times spent with Davey and my best friend Kingers!! That is super cute! King and Davey definitley wear it well! That's so cute. It's time for my family to start planning our costumes for this year. I wonder if my girls would like to be monsters. What a cute monster hoodie! I have a collection of costumes I collect them year round! How adorable! He looks like he really enjoyed the hoodie I want one for myself (big kid) lol! That is super cute! I think I would totally wear one. But, my cat would be ticked! Oh so cute, fun and adorable! No way my cat or dogs would wear this though, but too cute! OMGosh that's hilarious! At least it's getting good use! Super cute photos! This is the cutest monster hoodie! I love it on both of them! It is super adorable on both of them! Although, Davey looks much happier than King.LOL I love when I find two uses for one product! They both look super cute in it! I love putting my dog in a halloween costume. He's not a big fan of it though. LOL! Kids are so funny!!! That is really awesome! I can see my boys wearing that too!! Oh my goodness that's cute. I can see my son loving it. That monster hoodie is SO cute! I love that you put it on both your dog and your kid! This is too cute! Very crafty and perfect for monster lovers! Twins! They both look adorable in it. I can see why your son loves it too. So cute! What a crafty hoodie for a kid to wear...Love that you also put it on your dog! HAHA! that's so cute! I don't know who is more adorable your son or the dog with it on! Oh my gosh I can't even handle the cuteness! My daughter would ADORE this! So cute! My kids would love these! Getting my dog to wear it though... That diva wouldn't have it! What a cute hoodie. My boys would love to have something like that, they are a silly bunch here and that would be used during pretend play, as well as when we go out. Never even seen a hoodie like this, must try to find one that my boys would like!